Let's talk about men's fashion. 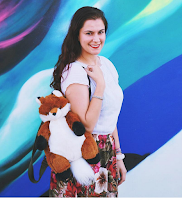 We see tons of women's fashion styles, but I want to mix it up & give you something alternative to sink your teeth into. 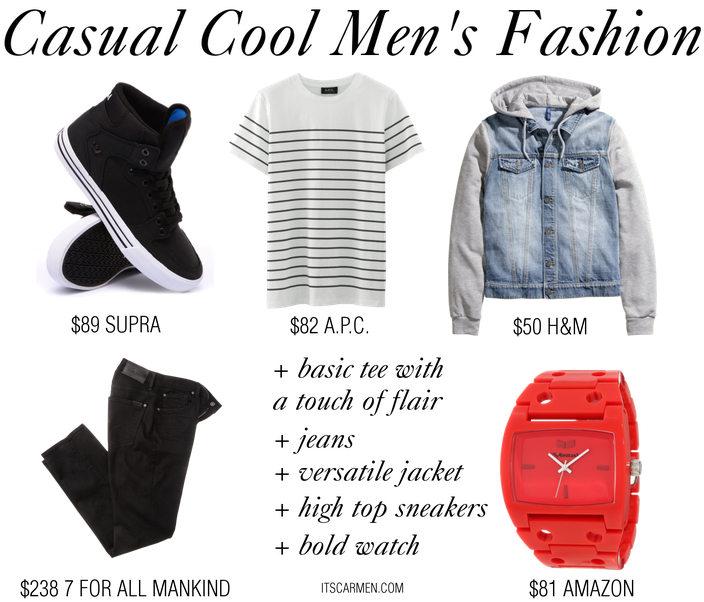 How about we check out a casual cool men's fashion look? This man is relaxed & down to chill. He's pretty much the bee's knees, the cat's pajamas. Shall we? At first I wasn't really sure what look I was going for, but I started to browse around & piece together an outfit; eventually I came up with this casual, cool style. This gentleman would pair simple & functional items together to create a carefree California look. The Vaider Sneakers by Supra may cost $89, but they're fresh & sleek. I love high tops & own many pairs myself, so they're gender neutral. Supra has several styles & colors to choose from. The ultimate basic cotton jersey shirt goes to the A.P.C. Lagoon T-shirt. Silkscreened stripes. Straight cut. Rounded neckline. Okay! If you want a bargain, these shirts are $20 & under: Men's Striped Short Sleeve, Southpole Men's Tee with Uneven Stripes, & G by GUESS Men's Striped V-Neck. Pick your favorite pair of jeans. It doesn't really matter as long as you like them & they fit nicely. I like the dark wash of these 7 For All Mankind Straight Jeans. These Lee Men's Regular Fit Straight Leg Jeans are under $45. Not even sure how that's possible. I love the duality of H&M Hooded Denim Jacket. It looks like a denim vest layered over a grey hoodie. It's a trickster like that. H&M really has some excellent choices for men. My boyfriend buys some items from there. Last but not least, I have to add some element of color or else it would be very out of taste for me. I picked the Men's Destroyer Red Watch because it's bold & bright, but not too much for your man to feel embarrassed about. Bonus points for it being water resistant! This outfit can be seen on most hip and fashionable twenty-somethings in California mainly because of its functionality and design. A pair of dark jeans can be worn every day of the week and no one would notice. Although I prefer neutral colors to bold ones, I can appreciate that the red watch is a focal point in this specific ensemble. I'll stick to my trusty iPhone to tell time. Rather than high-top sneakers, I opt for comfort when it comes to shoes. Recently I have adopted a love for runners after a long tenure with Vans. The hybrid denim jacket is cool but I wouldn't pick it off the rack. Overall this look screams a relaxed comfortable look. I can see anyone from an EDM DJ to a skilled b-boy rocking this. You can't go wrong with black jeans, a basic tee, and a cool jacket. Great picks, in love with the sneakers. Ooh, what an interesting little post, getting your boyfriend to contribute a little. I honestly wish my boyfriend was a bit more stylish, because who doesn't like a man who dresses well? I like the look, especially the semi striped tee! This is a great look for guys! I don't see a lot of stylish men where I live and I only wish they choose to wear something like this! You'd make a fantastic men's stylist ;) Loving all of your picks and I agree they're very LA-friendly (especially those Supra sneakers!) I can imagine lots of guys around here wearing this outfit! And if I had a boyfriend myself, I'd make him wear this hehe. i could totally see that striped shirt on my hubby! This is the right spot to buy Men's casuals.I love it. Great picks and ideas, love the colours! so cool I love your set and I've just written about men's style. What a coincidence. love the mens selection! i personally think they have better clothes and they are better made. Ooooh I like this! Very few female bloggers talk about mens clothes so this is refreshing! My boyfriend is so basic though (uniform of jeans, boots and a black or white vneck) so when I look at mens stuff, I can't look at it with him in mind haha.